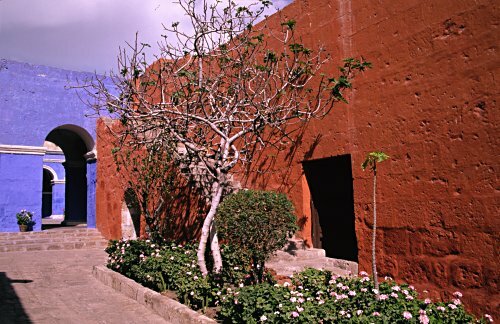 The Convento de Santa Catalina is one of the major attractions of Arequipa. The compound is huge - covering some 20,000 square metres. Built in the 16th century, it was almost a city within the city. Contact between the 450 nuns living here and the outside world was fairly limited until 1970 when the convent was opened to the public. The buildings are made of “sillar”, a volcanic material that is readily available near Arequipa and is easy to work with. This may partly explain the elaborate design of the facades. There are several distinct styles, including Spanish, Andalusian and indigenous elements.